Thanks, everyone, for a successful year. 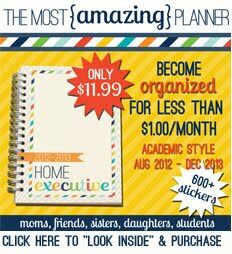 The 2012-2013 Home Executive Day Planner is now sold out. We look forward to another successful year next year. Until then, be sure to "Like" us on Facebook to stay updated on next year's Planner as well as other fun things. 43 comments on "Sold Out"
So...does that mean the one that I ordered and paid for last week won't be coming? Patty, if you paid for a planner that means your order went through before we sold out. Please send me an email at jen.picketfence@gmail.com and I can look further into your order. I need a last name or an email address to find your order. Is there no possible way to order 2 planners for this year? Do you only sell them once a year? I just found these today and have been scouring the internet for a way to get them but so far have been unsuccessful. Yes I'm very interested too on how to get one, when will they be available???? Yes, what f we'd be ok getting the week fer Christmas to lighten up your load? This looks so cute & perfect.......my husband & kids always get me a calendar for Christmas & I told him abut this & he said sold out........hoping he's pulling my leg! I have 7 left as of 5 minutes ago. I went to some local stores who were selling them and took EVERYTHING they hadn't sold. I hope you ladies can get this message soon. I also have one other option. If you look on my sidebar under "Find a Store," one of my buyers is now selling them online. Click on BYU Bookstore and it should take you right to the planner. Happy Holidays everyone! Do you still have any available? I'm interested! Thanks! When will these calendars be available for purchase again? I would really love to get my hands on one. Thank You! Really would love to purchase one as well but the BYU bookstore is also coming up as sold out. I am also VERY interested in purchasing this. It's exactly what I've been looking for for months! Any chance there will be a reprint? I am so sad that I missed out on this planner! The BYU bookstore is sold out as well :( Along with these other ladies who posted, just curious if there will be another chance to buy it? I don't even mind if it's already 2013!! I am also interested and would love to hear any updates about future availability. Thanks! Lots of people want them!! They are so cute! Add me to the list of sorry I missed this. Is there really no chance of finding them anymore? Looks like it's time to start working on a 2013-2014 version! I'd LOVE this, too. I'm a working mom, and I can tell you, this looks PERFECT for me - simple, easy to read, and places for me to plan ahead (meals, Thanksgiving, Christmas, birthdays). And best of all... Affordable!!! Put me on the "please do a reprint" list, as well! I would LOVE to have this! PLEASE Put me on the "please do a reprint" list, as well! I would love one of these too!! Soooo...I would like one to. In fact would LOVE one. So can my name be added? Or contact me if we need to resort to picketing in front of the distributors. Just kidding but seriously would love one! Please reprint! I need this in my life pronto! How can I get one of these? The BYU link does not have any available. I absolutely NEED one of these...Roseanne_ricke@hotmail.com....PLEASE REPRINT and let me buy one!! Please let me know when there are more! I need one for this New Year! Please let me know if you're planning to reprint! I should really like one! I am with the reprint crowd :) I would love one! I would love one as well!! I want one as well! Please tell me your making these I would love one! I too would LOVE one. Hi I really wanted to buy this calendar! Please reprint asap! and email me asfernandes@sbcglobal.net, even if it is only a 2013/2014 version!